Dental floss is a tool that one should use daily to remove food and bacteria build up in between your teeth. When you floss, you are cleaning the areas of the teeth that a toothbrush cannot access and breaking up the attempts of the bacterial plaque to create what is an intelligent plaque civilization. Most people don't realise that this step plays an important role in dental health. What are the health benefits of flossing? • Prevents gum disease - gingivitis, a build-up of plaque around and under the gum line. It eats away at the soft tissue and bone and can eventually cause tooth loss. • Flossing can help you get rid of dry mouth. Keep in mind that having problems with your teeth is not just bad for your health, it's not good for your wallet, either. The less you floss, the more it may cost you in the long run for doctor's visits and dental procedures. 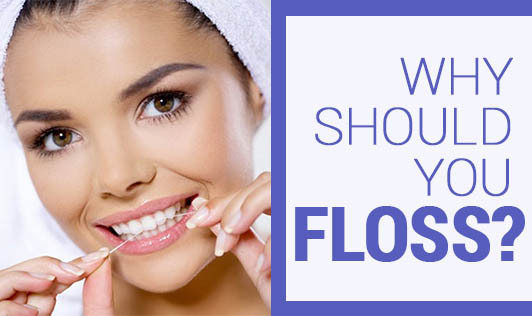 By flossing regularly you can cut down on many potentially costly disease control procedures and dental work.